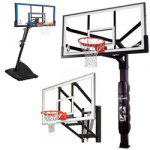 Large selection of basketball goals, backboards, hoops, rims, complete systems & accessories. Best commercial equipment for sale. Fast Free Shipping on most orders! Factory direct basketball equipment & accessories. DIY and Save! Basketball-Goals.com for the best hoops and backboards available. Whether you’re looking for portable basketball hoops for the driveway or an in ground fixed height system for the school yard, Basketball-Goals.com has what you’re looking for. We carry an extensive line of basketball systems for home use such as portable basketball systems, in ground adjustable basketball goals, but where Basketball-Goals.com really shines is in the commercial basketball equipment arena. For over 15 years Basketball-Goals.com customers have benefitted from the intimate relationship between our manufacturers and ourselves. By now we have asked questions on nearly every topic on every product we’ve sold to make sure our customers get quick, expert advice, and answers to their questions. This constant feedback of information sharing between Basketball-Goals.com and our manufacturers has enabled us to expertly help outfit school gymnasiums, parks, and playgrounds, throughout the USA with the best quality portable basketball goals, in ground basketball systems, and wall mounted basketball systems. Our full lines of accessories include; rims, poles, padding, anchors, ground sleeves, basketball court tile, court stencils, and just about any accessories you would want, to participate in the game of basketball. Basketball-Goals.com web site was developed with the customer in mind, allowing anyone that visits the ability to obtain a quote with freight included, just by clicking the Get Quote button located on the detail page on all our systems. Allstate Capital Funding is also available; simply click the finger in the above rotating carousel image to apply. Got a question? We would love to hear from you, call 866-892-7277, or send an email to: admin@basketball-goals.com.